Synthetic phospho peptide (Human) - which represents a portion of human Breast Cancer Gene 1 around serine 1466. HeLa whole cell lysate (25µg/lane) treated with 10 Gy IR. Antibodies that were not phospho-specific were removed by solid phase absorption. 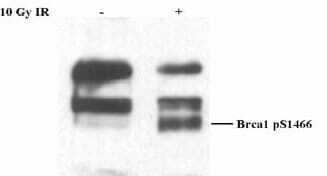 Antibodies specific for phospho BRCA 1 (Ser 1466) were affinity purified using the phospho peptide immobilized on solid support. Our Abpromise guarantee covers the use of ab3614 in the following tested applications. WB 1/1000 - 1/10000. Detects a band of approximately 210 kDa (predicted molecular weight: 210 kDa). Sample: Whole Cell Lysate (25ug/lane) from Hela cells treated with 10Gy IR or untreated. Rabbit anti-BRCA1 pSer1466 (ab3614) used at 1:2,000 dilution. ab3614 has not yet been referenced specifically in any publications. Publishing research using ab3614? Please let us know so that we can cite the reference in this datasheet. There are currently no Customer reviews or Questions for ab3614.